We understand the challenges of moving in California. From building restrictions to traffic congestion, we have a process in place to make your move as smooth as possible. Our complete line of moving services including delivery of boxes and supplies, full packing and unpacking, secure storage facilities, and a flexible rate schedule. Moving can be a very stressful event. We're here to take the stress out of it. Our guys are very courteous, dilligent workers. 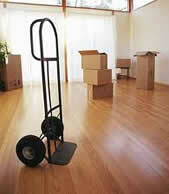 They are all well trained and have the utmost respect for our clients and their belongings. We have an expert knowledge of the Bay Area and all out trucks are equipped with GPS systems and rear view safety back up cameras. Book your move ASAP, the further ahead of time the better. We usually book moves 2-3 weeks in advance. Book further in advance for weekends or end of month. Contact Us as soon as possible to ensure you get the date you want. If your street does not allow double-parking, or is normally crowded with parked cars, you may be able to block off parking with your vehicle or a friend's vehicle (3 car lengths required). If that isn't possible, you will need to call SFMTA and obtain a parking permit. Parking Permits require at least 8 days advance notice. Your local Police Station can also advise you on parking requirements and procedures. If possible, avoid booking your move during street cleaning. It is your responsibility to ensure proper parking for the movers. You will be charged for any parking ticket fees our moving truck incurs during the move. If you purchase this coverage, the mover remains liable for the amount up to 60 cents per pound per article; but the rest of the loss is recoverable from the insurance company up to the amount of insurance you purchased. If you wish to purchase additional insurance we recommend Moving Insurance.com there you will find details about their pricing and policies.